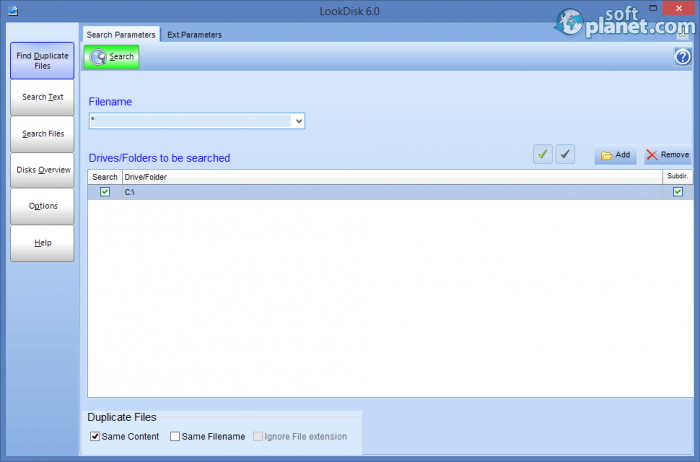 SoftPlanet makes it possible for everyone to get free LookDisk download directly from our servers. There is no registration needed for downloading. When we work with our computer we gather a lot of information on it that can't be found so easily when the amount of data increases too much. Things become even more complicated if you need to find a specific text within one of the many files on your hard drive. LookDisk can help you in both cases, but the app is capable of a lot more. That's why it is surprising that the program is free and you can use its capabilities without any payment. Part of them are also the functions to find duplicate files or even to create an overview to your hard drives. When the application starts it opens a window where the program warns you that it is not able to determine if there will be any critical error if you remove, rename or delete a duplicate file. That's why it recommends that you make a backup of all the files that you want to delete or even better, for the whole operating system. Then it will be safe to delete any duplicate file that the app finds. The interface of LookDisk can be divided into two main panes that contain the most important features of the application and six additional buttons that give you even more functions. The two main panes are Search Parameters and Extended Parameters and they are situated on top of the interface of the app. From Search Parameters you can set the file name that you are looking for and what drives and folders will be searched. As you can guess by the name, with Extended Parameters you can add even more options, like for example you can set files, folders and drives that will be excluded from the search. You can also set File Attributes as a search option. 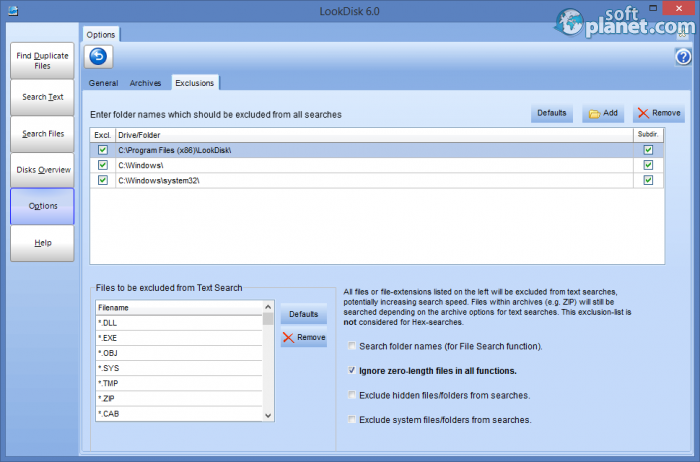 You can include or exclude archives, read-only, hidden and system files. The six mentioned buttons are for the fulfillment of the task after you set them up from the main panes. You can use them to Find Duplicate Files, Search Text, Search Files or to create Disks Overview and to set various Options. From there you can also use the Help the that app offers. 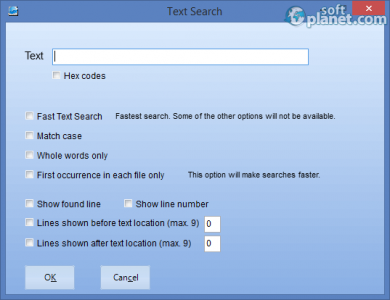 From the options you can adjust some useful options, like for example you can choose the file types that can be excluded from the text search. All of them make the app very customizable. 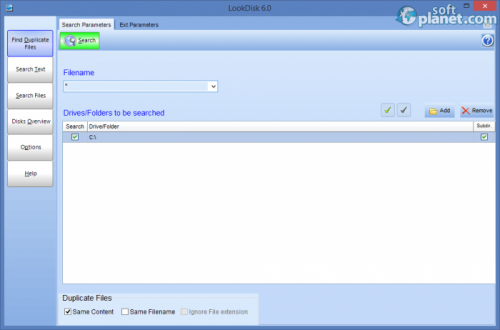 If you need a capable application that will do everything that you want to access your computer, we recommend LookDisk, not only because it is free, but also because it does the job. The program offers various functions that can be adjusted in a lot of ways, which means that you can use the program in the way that you want to. The customization options are so many and they give various choices for every function that you can use. For example, you can set what files will be excluded for text search, which means that you can quickly find what you look for if you remember the file type. Our security scan shows that LookDisk is clean from viruses. The current version of LookDisk has been scanned by our system, which contains 46 different anti-virus algorithms. 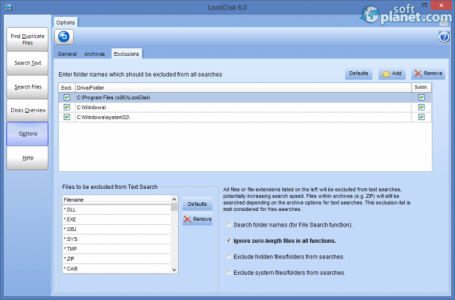 That ensures that LookDisk 6.0 is 100% safe for your computer.